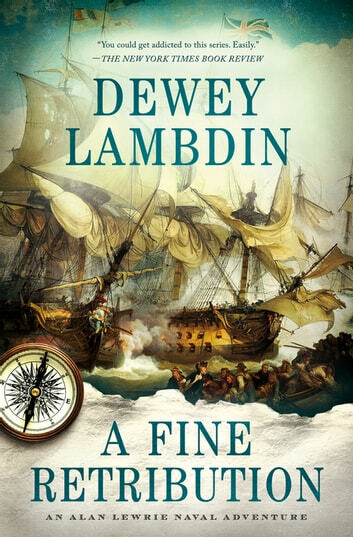 Dewey Lambdin, the reigning master of maritime fiction, continues the adventures of Alan Lewrie, Royal Navy, from his days as a midshipman to captain of his own ship and, though on somewhat dubious grounds, a baronetcy in the 23rd book in the Alan Lewrie series, A Fine Retribution. Captain Alan Lewrie and his small squadron defeat four French frigates off northern Spain, winning honor, glory, and renown. So, why is such a successful captain suddenly without a ship, or another active commission? Why do rumors swirl that jealous foes’ powerful patrons are blighting his career? Months on end ashore, even in entertaining London setting up a household for himself and his retinue, getting his portrait painted, put him in serious sulks. Well, the artist is the sister of one of his midshipmen, a delightful and talented young lady of a modern outlook, but not modern enough to become Lewrie’s lover. Dare he risk a second marriage? Then, just when things are the rosiest, at last, Admiralty calls upon him to develop and command a plan to raid French-held coasts, not with sailors and Marines from his own ship, but with a battalion of Army troops carried in a squadron of transports. It’s intriguing, novel, and a way back to sea, but…can he part from the desirable Jessica Chenery? And if Lewrie does, will his foes allow him to succeed? Be certain that Alan Lewrie will prevail, scruples be damned!